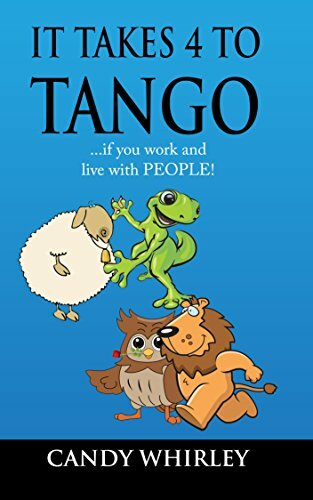 It Takes 4 To Tango...if you work and live with PEOPLE! This fun, simple book was written by request from my national and international clients!Thanks for the kick to do it! In the dance world, yes, it takes two to tango but in the REAL world It Takes 4 To Tango! There are four main personalities in the workplace. The differences between these four personalities can sometimes make it hard to communicate and get along. We often try to communicate with other people (personalities) like we want to be communicated with, not the way THEY want to be communicated with. So what happens? We have communication break downs, negotiation let-downs and delegation fall-downs. It Takes 4 To Tango is the guidebook to solve these problems simply and fast! Discover how to: 	Communicate with people who are not like you 	Identify the DARK side of a personality 	Give feedback to the different personalities 	Emphasize your strengths 	Teach your children the life lesson...that people are not difficult just different!